I think it's fair to say that most people have (at least) a passing sense of Homer's Odyssey. From Armand Assante to the Coen Brothers to James Joyce, the story of Odysseus's voyage home has been told many times. 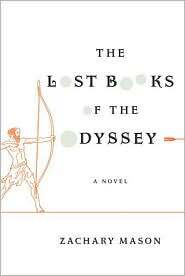 The Lost Books of the Odyssey by Zachary Mason, however, is not your Grandfather's Odyssey. The book opens with a preface to inform readers that the work is a new translation and reinterpretation of Homer's classic. Mason claims to have culled the true story of Odysseus from “a pre-Ptolemaic papyrus excavated from the desiccated rubbish mounds of Oxyrhyncus.” Whether or not we choose to believe Mason's claims of historical evidence matters little, because, with a turn of the page, we're along for the ride. Mason's book is touted as a novel, but the forty-four vignettes could arguably be read in any order. The vignettes vary in length from several paragraphs to several pages. Their subject matter is just as varied. As the voice and language change with each story, different emotions emerge. There is fear and mistrust, longing for home and wanderlust. The Lost Books of the Odyssey is as much about the Iliad as it is about the Odyssey, and the stories range from the plains of Troy to the shores of Ithaca. While most of the stories are about Odysseus and his cunning, several focus on other Homeric characters, such as Achilles, Menelaus, and Polyphemus the Cyclops. But Mason doesn't just retell from different points of view. With a genuine zeal for his subject matter, he creates an Odyssey all his own: Odysseus is a patient in a sanatorium, his adventures nothing more than a fever dream; the Iliad is actually a story concocted to help students memorize the moves of a famous chess game; Penelope is a werewolf, and a lover not to be trusted; and, in my favorite of the vignettes, Odysseus is imagined as a Magus (something of a Hellenic Rabbi Loew) who crafts a simulacrum Achilles out of river clay: a “Myrmidon Golem” to terrorize the Trojans. This is a fun and engaging book, though I would caution against reading too many stories in a row. A slower reading of the myriad voices (and tales they tell) will reward the reader with the ability to savor each one. The Lost Books of the Odyssey will likely inspire readers to return to (or pick up for the first time) Homer's original epic. Personally, I now wonder if (as Mason proposes) it is just a shaggy dog story to explain away Odysseus's truancy. One thing is for sure: My next encounter with the Odyssey will be unlike the last time.